James Earl (Jimmy) Carter was without question the most inept president of my lifetime, at least until the present occupant of the White House was elected. One might think that after a four year tenure of abject failure both in domestic and foreign policy, such a man would slink away back to Georgia and never make any public statements about subjects he obviously knows very little about. We are not that lucky. Ever since the American people decided to pass on another four years of having this grinning idiot in the White House, Jimmy Carter has insisted on butting in and speaking his piece where he is not wanted and not needed. Just now he has taken it upon himself to present his resolution to the crisis in Gaza with a column in Foreign Policy which he co-wrote with Ireland’s former president and current left-wing whack job, Mary Robinson. A quick summary of this column would read, it is all Israel’s fault. Israel has committed war crimes by not allowing Hamas to continue to attack its citizens and should withdraw, end the blockade on Gaza and allow Hamas to continue to try to kill the Israelis. Then we will have peace in the region. Here is the column. You decide if my summary is fair. Israelis and Palestinians are still burying their loved ones as Gaza’s third war in six years continues. Since July 8, when this war began, more than 1,600 Palestinian and 65 Israeli lives have been sacrificed. Many in the world are heartbroken in the powerless certainty that more will die, that more are being killed every hour. Who has started these wars? If Hamas would stop trying to kill the Israelis, the fighting would stop. Israel is not dedicated to the destruction of the Palestinians either on the West Bank or Gaza. Hamas is openly dedicated to the destruction of the Jews. Fatah is just as dedicated to the destruction of Israel but they have the good sense not to say so, at least not in English. What they say in Arabic may be quite different. This tragedy results from the deliberate obstruction of a promising move toward peace in the region, when a reconciliation agreement among the Palestinian factions was announced in April. This was a major concession by Hamas, in opening Gaza to joint control under a technocratic government that did not include any Hamas members. The new government also pledged to adopt the three basic principles demanded by the Middle East Quartet comprised of the United Nations, the United States, the European Union, and Russia: nonviolence, recognition of Israel, and adherence to past agreements. Tragically, Israel rejected this opportunity for peace and has succeeded in preventing the new government’s deployment in Gaza. It is all Israel’s fault for somehow not trusting the good intentions and good faith of the people who have sworn to destroy them. Has Hamas recognized Israel’s right to exist as a Jewish state? Has Hamas adhered to past agreements? When Israel withdrew from Gaza and handed over control to the Palestinians, they promptly elected Hamas as their leaders and began to attack Israel. Two factors are necessary to make Palestinian unity possible. First, there must be at least a partial lifting of the 7-year-old sanctions and blockade that isolate the 1.8 million people in Gaza. There must also be an opportunity for the teachers, police, and welfare and health workers on the Hamas payroll to be paid. These necessary requirements for a human standard of living continue to be denied. Instead, Israel blocked Qatar’s offer to provide funds to pay civil servants’ salaries, and access to and from Gaza has been further tightened by Egypt and Israel. Israel must end the blockade so that Hamas will have a chance to import more rockets to attack Israel. Why does Carter think Israel imposed the blockade? Does he really think the Israelis want to starve the Palestinians? They do allow humanitarian aid into Gaza. They do not allow any weapons or any item that could be made into a weapon. They do not allow construction materials since those materials are used to build tunnels for evading the blockade.Israel imposed this blockade after Hamas began to fire rockets into Israel. Israel would probably lift the blockade if Hamas stopped trying to kill Israelis. This next section is the best (worst) part of the column. There is no humane or legal justification for the way the Israeli Defense Forces are conducting this war. Israeli bombs, missiles, and artillery have pulverized large parts of Gaza, including thousands of homes, schools, and hospitals. More than 250,000 people have been displaced from their homes in Gaza. Hundreds of Palestinian noncombatants have been killed. Much of Gaza has lost access to water and electricity completely. This is a humanitarian catastrophe. There is never an excuse for deliberate attacks on civilians in conflict. These are war crimes. This is true for both sides. Hamas’s indiscriminate targeting of Israeli civilians is equally unacceptable. However, three Israeli civilians have been killed by Palestinian rockets, while an overwhelming majority of the 1,600 Palestinians killed have been civilians, including more than 330 children. The need for international judicial proceedings to investigate and end these violations of international law should be taken very seriously. The reason so many Palestinian civilians have been killed is because Hamas wants them to be killed. Israel protects its civilians. Hamas uses its civilians as human shields. There is a larger issue here and I am afraid that what I am about to say will seem to be very ugly. Well, war is ugly. For a person who has lived through World War II and served in the United States Navy, Jimmy Carter is astonishingly obtuse about the nature of war. If we had fought the Second World War as he expects Israel to fight, we would have responded to the attack on Pearl Harbor by bombing one Japanese base. Anything more would have been disproportionate. We would not have bombed the Japanese home islands or sunk Japanese cargo ships. That would have been an unacceptable attack on civilians. We certainly would not have dropped incendiary bombs on the residential quarters of Tokyo, knowing that their wooden houses would burn readily nor would we have dropped the atomic bombs. The war might have been conducted more humanely as a result. We would probably still be fighting the Japanese. The way to end a war and bring about peace is the utterly destroy the enemy’s will and capacity to fight. This might mean bombing the factories that produce the weapons the soldiers use. This might mean killing civilians to break the enemy’s will to fight. War is hell. General William T. Sherman said this out of personal experience. During the Civil War, his soldiers burned down plantations and destroyed railways in order to destroy the Confederates’ ability to wage war. Jimmy Carter might have considered these actions to be war crimes, but they ensured that the South would not rise again. It is a cruel irony that the most likely chance for peace in the Middle East would be if Israel really were the villain people like Jimmy Carter think it is. Because Israel is a decent nation, the fighting will go on. Jimmy Carter probably thinks he is on the side of peace. He is not. By his statements, he is giving hope to Hamas that they need only hold out until Israel is pressured to withdraw without finishing the job of destroying Hamas’s ability to fight. He is not promoting peace in the region. He is paving the way for continual war. The U.N. Security Council should focus on what can be done to limit the potential use of force by both sides. It should vote for a resolution recognizing the inhumane conditions in Gaza and mandate an end to the siege. That resolution could also acknowledge the need for international monitors who can report on movements into and out of Gaza as well as cease-fire violations. It should then enshrine strict measures to prevent the smuggling of weapons into Gaza. Early discussions have already taken place. The Elders, an international group of elder statesmen of which we are a part, hope these discussions will continue and reach fruition. At the Palestinians’ request, the Swiss government is considering convening an international conference of the signatory states of the Geneva Conventions, which enshrine the humanitarian laws of warfare. This could pressure Israel and Hamas into observing their duties under international law to protect civilian populations. We sincerely hope all states — especially those in the West, with the greatest power — attend and live up to their obligations to uphold the Fourth Geneva Convention, which governs the treatment of populations in occupied territory. I am sure that any action by the UN will be completely impartial and will only serve the interests of peace. That was sarcasm. Unity between Fatah and Hamas is currently stronger than it has been for many years. As Elders, we believe this is one of the most encouraging developments in recent years and welcome it warmly. This presents an opportunity for the Palestinian Authority to reassume control over Gaza — an essential first step towards Israel and Egypt lifting the blockade. Why is unity between these two factions desirable? What has been drawing them closer? Has Hamas given up its goal of destroying the Jews? The Palestinian Authority cannot manage the task of administering Gaza on its own. It will need the prompt return of the EU Border Assistance Mission, an international effort to help monitor border crossings that was launched in 2005 and suspended in 2007. EU High Representative Catherine Ashton has already offered to reinstate the program, covering not only Rafah but all of Gaza’s crossings. Egypt and Israel would, in turn, cooperate with international monitors to be deployed in Gaza and along its borders, backed by a U.N. Security Council mandate to protect civilian populations. A valuable precedent for trust-building between Egypt and Israel is the international peacekeeping force operating in the Sinai, mandated by the peace treaty signed by the two countries in 1979. The international community’s initial goal should be the full restoration of the free movement of people and goods to and from Gaza through Israel, Egypt, and the sea. Concurrently, the United States and EU should recognize that Hamas is not just a military but also a political force. Hamas cannot be wished away, nor will it cooperate in its own demise. Only by recognizing its legitimacy as a political actor — one that represents a substantial portion of the Palestinian people — can the West begin to provide the right incentives for Hamas to lay down its weapons. Ever since the internationally monitored 2006 elections that brought Hamas to power in Palestine, the West’s approach has manifestly contributed to the opposite result. We could have said something similar about the Nazis and the Japanese military government. Both the Nazis and the militarists represented a substantial portion of their respective countries. Ultimately we brought about their demise. Why don’t we give Israel the chance to bring about the demise of Hamas. We ought not to recognize the legitimacy of a political actor as movement that has genocide as its goal. Ultimately, however, lasting peace depends on the creation of a Palestinian state next to Israel. Leaders in Israel, Palestine, and the world’s major powers should believe that policy changes are within reach that would move Israelis and Palestinians closer to a day when the skies over the Holy Land can forever fall silent. A lasting peace will only occur when the Palestinians realize that they cannot defeat or destroy Israel and that Israel is here to stay. They must come to understand that they have more to gain by making peace than waging war. This is why Egypt made peace with Israel. Anwar Sadat realized that Egypt could not defeat Israel and that the continuing hostility with Israel was wrecking his country. Unfortunately the antics of people like Carter make this realization, and peace, unlikely. Jimmy Carter should stick to what he knows, building houses for Habitat for Humanity. Poll: Huge majority in Gaza want lasting ceasefire (timesofisrael.com) Maybe there is hope. Is Obama really like Carter? There have been many who have made the connection based on the similarities of a faltering economy and a weak foreign policy. I don’t think the connection is entirely accurate based on the two men’s personality and presidential style. In personality, Obama is actually rather more like Nixon. He seems to be an introvert who doesn’t like people all that much and is not really a natural politician. He also has a nasty, vindictive side to his personality, like Nixon. Obama does not seem to be quite the intellectual Nixon was, though Nixon was careful to hide this in order to appeal to the ordinary people. In governing style, Obama and Carter could not be more dissimilar. Carter was a micromanager, who oversaw everything that was going on in the White House, perhaps at the expense of losing sight of the big picture. Obama does not seem to be interested in the minutiae of governing and seems to leave the details to others. Perhaps he sees himself as being like Reagan who set the overall policies and left the details to his staff. Obama has taken this as far as largely outsourcing his legislative work, including his signature achievement Obamacare, to the Congressional Democrats. In this column, in USA Today, Robert Pastor argues that Barack Obama is indeed like Jimmy Carter, and that is a good thing. Here are a few excerpts and comments. Both think that war should be the last option, and that a multilateral approach is a better way to share the burden and to strengthen alliances. To rescue our hostages and mete out justice to bin Laden, Carter and Obama took risks. Carter’s rescue mission in Iran failed, though he did get all our hostages out safely. Obama succeeded against bin Laden, but we suffered a terrible loss at the U.S. Consulate in Libya with the death of our ambassador and three other Americans. I don’t think that we have ever had a President who didn’t believe that war must be the last option. The trouble lies in understanding how to prevent wars. Obama and Carter both seem to believe that the US is the problem in the world and therefore if only we adopt a humbler posture, other nations will reciprocate. This really doesn’t work. In fact, potential aggressors are likely to view an apologetic America as a weaker America and will be more inclined to cause trouble. I do not think that it was a coincidence that the hostages were released on the last day of Carter’s presidency. The leadership of Iran reasoned that Reagan was more likely to behave aggressively and decided that the costs of continuing to hold the hostages was greater than the benefits. Carter and Obama both understand that peace in the Middle East requires pressure on both sides. Carter paid a political price but succeeded at Camp David. Obama tried but failed. Believing our interests are identical with one side, Romney might not even try. Threatening war against Iran and Syria as Romney has done might be more satisfying than negotiating with fanatics, but Carter’s goal was to gain the release of U.S. hostages and Obama’s is to prevent Iran from acquiring a nuclear weapon. If we see negotiations as weakness, we will be left with no other option but war. Obama is not Carter, and the times are very different. But Carter’s legacy is instructive for both candidates. Strength should be judged by a willingness to make decisions that might be unpopular but would advance the national interest. It may well be that war is the only option left with Iran. Whether or not the leadership of Iran is made up of fanatics, the simple truth is that there is little, or nothing we can offer them that might induce them to give up the quest for nuclear weapons. They are rational enough to understand that if they acquire nuclear weapons, they will be in a far better negotiating position. They interests lies in delaying any present negotiations until they gain nuclear weapons. As for Camp David, Carter actually had little to do with that. The peace between Israel and Egypt came about because Anwar Sadat realized that Egypt would never be able to defeat Israel. He therefore decided that Egypt had more to gain with peace than by continued fighting. If Sadat had good reason to believe that Israel was weak and could be defeated, he would not have made peace. The problem in the Middle East right now is that Israel’s enemies have good reason to believe that by continuing their efforts to isolate and delegitimize Israel, they can weaken and ultimately defeat Israel. Undermining Israel, as all of the people who profess to be for peace seem to be doing, only makes peace less likely because it gives Israel’s enemies hope that they can prevail. And yes, our interests are largely identical with one side. Israel is a democracy with values similar to our own. Its enemies are terrorists and dictatorships who hate us, and our values. I do not believe we should be even-handed at all in our relations in the region. We should support our friends and oppose our enemies. With that criterion, Carter’s decision to negotiate a Panama Canal Treaty — a very unpopular but essential decision — should qualify. Carter promoted human rights not just against our Cold War enemies, but also against anti-communist military regimes. He was not afraid to negotiate with adversaries, establishing relations with China and securing the release of 3,600 political prisoners and CIA veterans from Cuba. I am not at all convinced that handing over the most important maritime trade route over to an unstable, corrupt nation is such a good idea, not to mention the simple fact that we were the ones who built it. The problem wasn’t with Carter’s willingness to negotiate with out adversaries. The problem is that Carter gave the impression of being a weakling who would turn against out allies to appease our enemies. It was all very well to make human rights a keystone of our foreign policy, but if we restrict our alliances to nations with perfect human rights records, we will find ourselves with very few friends in the world. We don’t often have a clear choice between good and bad. More often the choice is between bad and worse. Communism was the greatest threat to human rights throughout the Cold War, and by losing sight of this fact, Carter did the cause he professed to support a great deal of harm. It’s time to re-define what we mean by strength and weakness. Strength should mean the readiness to take necessary but unpopular decisions. Leadership requires understanding the perspective of our adversaries and negotiating with persistence rather than assuming that our interests are incompatible and that only force can achieve our goals. Americans should be reminded of the many hard, but courageous, decisions Carter made and why we are better off because of them. We are not precisely because Carter did not understand the need to be strong. International politics has not really changed all that much in the last five thousand years of recorded history. Names and customs change, but the realities of power do not. The most important of these realities is that if you truly want peace, you must be prepared to fight for it. Expressing an unwillingness to ever fight, or signaling that you want peace at any price is the surest way to war. Negotiations are good, so long as you are negotiating to advance your country’s interests and not talking for the sake of talking to avoid conflict. Jimmy Carter urges Obama not to ‘draw a line in the sand’ for Iran (timesofisrael.com) After all these years, Carter has still not learned the lesson. I had been wondering if Jimmy Carter could possibly top himself after sending condolences to North Korea over the loss of their Dear Leader. Well, I need wonder no more. The radical Islamic Muslim Brotherhood and the really radical Salafi Muslims are taking over Egypt and Carter is “pleased”. Here is the story at Breitbart.com. “But in general the will of the people has been expressed accurately,” he said on the eve of the end of the polls. I don’t doubt that the will of the Egyptian people has been expressed. That is actually most of the problem with democracy in the Middle East. What the people want is not tolerance and freedom. Egypt’s two main Islamist parties have scored a crushing victory in the seats declared so far, reflecting a regional trend since Arab Spring uprisings overthrew authoritarian secular regimes. The powerful Muslim Brotherhood, the country’s best organised political movement, has claimed the lead through its political arm, the Freedom and Justice Party (FJP). It has been closely followed by Al-Nur, which represents the ultra-conservative Salafi brand of Islam, raising fears among increasingly marginalised liberals about the prospects for civil liberties and religious freedom. I have a problem with the Islamists coming to power in Egypt. This is a disaster for our policy in the Middle East as great as the loss of Iran during Carter’s watch. I wonder if Carter is aware that the new government in Egypt will very likely abrogate the peace treaty with Israel, undoing the accomplishment he is most proud of. Why doesn’t Jimmy Carter stay in Plains, Georgia where he can’t do any harm? All over North Korea, the people and even nature itself is mourning the loss of their Dear Leader Kim Jong Il. It is hard to know how sincere the expressions of grief that North Korean television has been showing actually are. It is possible that many North Koreans, living in an isolated country and knowing only what official propaganda has been telling them really do feel a great loss. If you hear that the Dear Leader is the most wonderful person in the world every waking moment, you might come to believe it. Then too, North Korea is a country in which the insufficient display of grief might well get a North Korean and his entire family sent to a prison camp. With all that in mind, I can hardly blame the North Korean for their displays. I would be doing the same if I lived in North Korea. I would like to ask, however, what Jimmy Carter’s excuse is. This article from the Washington Times tells the story. North Korea is routinely labeled as one of the world’s most oppressive governments under an eccentric personality cult surrounding the Kim family. Harrowing reports from defectors describe North Korea as a dirt-poor nation filled with concentration camps and Communist propaganda. Kim Jong-il ran the reclusive country according to a “military first” policy since the mid-1990s, after a famine that may have killed as many as 2 million people. 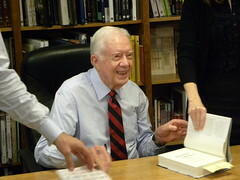 Mr. Carter has visited North Korea twice — including a 1994 visit for talks on nuclear issues that led to a deal in which North Korea agreed to dismantle its nuclear-weapons program in exchange for oil deliveries and the construction of two nuclear reactors. That deal collapsed in 2002. I honestly don’t know if Jimmy Carter is really that stupid or if he is simply evil. He has spent the bulk of his post-Presidential career befriending every anti-American dictator in the world while opposing our allies,especially Israel, which he considers to bear the entire blame for the lack of peace in the Middle East. He discredited himself with his awful presidency and I don’t know why anyone would care what he has to say on any subject. North Korean State News: Jimmy Carter Expressed Condolences On The Death Of Kim Jong Il (businessinsider.com) This article implies that the story may not be true, considering that North Korean propaganda is inventive to say the least. If so, than I retract the post, but my opinion of Mr. Carter remains unchanged. Its the sort of thing I believe he would do. That’s what Obama said. Next, he’ll be talking about the malaise that’s afflicting America. I have to wonder if he is consciously imitating Jimmy Carter. I mean same bad economy, weak foreign policy, etc. Speaking of Jimmy Carter, here is an interesting analysis from the Washington Times comparing Obama with Carter. The similarities are striking, and not just the bad economy and weak foreign policy. One of the most unpleasant things about Mr. Carter was the condescending disdain he could barely disguise for struggling Americans and their irritating malaise. Increasingly, Jimmy Jr. is having difficulty concealing that very same disdain for us as the political winds around him turn hostile and all of his bright ideas lie fallow as nothing more than socialist hocus-pocus. The problem with reaching a deal to raise the debt ceiling, he explained in a long sermon, is that there is this huge wave of Republicans who won control of the House in the last election by promising not to raise any more taxes and to cut the absurd overspending that has driven this town for decades. He bemoaned – in public – that these Republicans are more concerned about the “next election” rather than doing “what’s right for the country.” In other words, he is saying the honorable thing would be for these Republicans to ignore the expressed wishes of voters, break their campaign promises and raise taxes. Wow. As if the whole problem of Washington spending us into oblivion is the fault of stingy taxpayers and stupid voters. And what we really need is Jimmy Jr., who knows what is best for us despite what we may think. How did this man get past sixth-grade social studies, much less Iowa? When Mr. Obama finished his sermon about the contemptible Republicans keeping faith with their voters like a bunch of chumps, he then turned to his own intentions – and revealed even more of his contempt for us. This contempt and disdain for ordinary Americans can be found in many on the Left, including politicians, who one might expect to at least pretend to like the voters. Al Gore was another example that I can think of right away. He has the most irritating habit of speaking to people as though he were addressing a class of not very bright third-graders. It’s actually a wonder he managed to get highest popular vote in 2000, and as far as I am concerned, the best reason imaginable for keeping the Electoral College. But back to Carter II. I wonder when he is going to give a speech blaming the American people for their malaise, or get chased around a lake by a killer rabbit. From CBS. Barak Obama implied that Social Security checks might not be sent out on time if a deal on increasing the debt ceiling is not made by August 2. “I cannot guarantee that those checks go out on August 3rd if we haven’t resolved this issue. Because there may simply not be the money in the coffers to do it,” Mr. Obama said in an interview with CBS Evening News anchor Scott Pelley, according to excerpts released by CBS News. He is lying and he knows it. I don’t think that I have ever felt such contempt for a President before. Between his feckless appeasing foreign policy and his demagoguery as the country nears the abyss, he has to be the worst president of my lifetime. I didn’t care for Bill Clinton. He was a sleaze, and I am not just referring to his affairs. He was a pathological liar. But, he did seem to have the best interests of the country in some small corner of his mind. He could also be pragmatic. 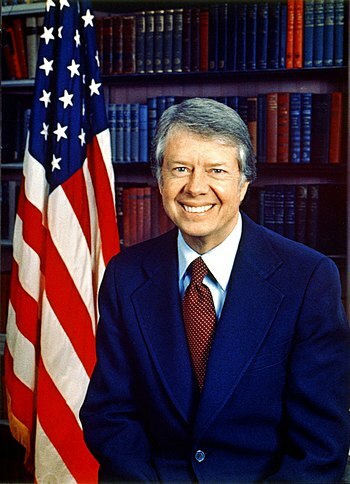 Jimmy Carter was bad, but mercifully, I was too young to remember much of his presidency. He was a weakling who mistook his weakness for moral virtue. George Bush I had no strong core beliefs of his own. He seemed to want to be president simply to cap off a career in public service. He seems to be a good man but he tended to react to events rather than cause events to happen. His son also seems to be a good man and stronger than his father, but frightfully inarticulate. He never seemed to be able to explain what he was doing or what he hoped to accomplish. This seems to be a Bush family trait. But again, of all these, Obama is the worst. No way! Well, according to his assistant in this story from the Toronto Sun, way! John Lennon was a closet Republican, who felt a little embarrassed by his former radicalism, at the time of his death – according to the tragic Beatles star’s last personal assistant. Fred Seaman worked alongside the music legend from 1979 to Lennon’s death at the end of 1980 and he reveals the star was a Ronald Reagan fan who enjoyed arguing with left-wing radicals who reminded him of his former self. In new documentary Beatles Stories, Seaman tells filmmaker Seth Swirsky Lennon wasn’t the peace-loving militant fans thought he was while he was his assistant. He says, “John, basically, made it very clear that if he were an American he would vote for Reagan because he was really sour on (Democrat) Jimmy Carter. Who was it who said that anyone under 30 who isn’t a liberal has no heart and anyone over 30 who isn’t a conservative has no head? Where does that leave me, since I’ve always been a conservative? Thanks to Drudge for this.